Non Woven Fabric Bag Making Machine is a revolution in the packaging industry with its more controlled and precise performance. In the machine, there are installed various control devices like auto-counting and other safety alarms for a safe and secure operation. It is also integrated with an advanced Ultrasonic-bonding technology that ensures highly strong seal in the bags. The major advantage in this machine is its auto tension control and accurate high speed cutting. It is highly acknowledged among customers for its excellent production speed, customization option in width and length of bag, requirement of less manpower and continuous operation. smooth. Such automatic devices as slotting device , punching device and metering device are equipped. 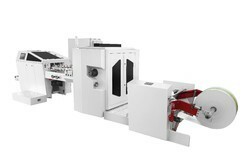 Looking for Carry Bag Making Machine ?